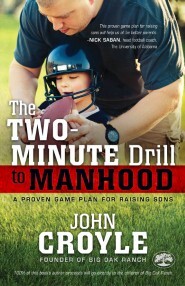 Written through the lens of football and faith, THE TWO-MINUTE DRILL TO MANHOOD: A Proven Game Plan for Raising Sons offers insight in how to prepare sons for authentic manhood. As a mother of two sons, I found this book incredibly helpful and insightful! It's full of Biblical principles to help us raise our sons with integrity and love. This book was such a pleasure to read. It flows along nicely and I really like how John shares a lot of personal stories from his own life. I was especially impressed by his work with the "Big Oak Boy's Ranch" what they are doing through this organization. I love how all the Scripture is woven throughout the book. You can't go wrong with parenting when you use the Biblical principles God set up for us. He shows us the practical steps to using these precepts to raise our sons in a godly manner; to raise them up to be godly men. My absolute favorite part of the book is the last chapter. It's entitled "What We Learned about Manhood From Our Dad: An Interview with Brodie Croyle and Reagan Croyle Phillips". This chapter shares questions and answers from John's children. It's also filled with pictures of John and his family. I loved how they shared their hearts and love for their father. It was such a beautiful testament. I highly recommend this book to parents of sons! It's a wonderful book filled with great principles that will help you guide your son into being a godly man. It's a wonderful book!